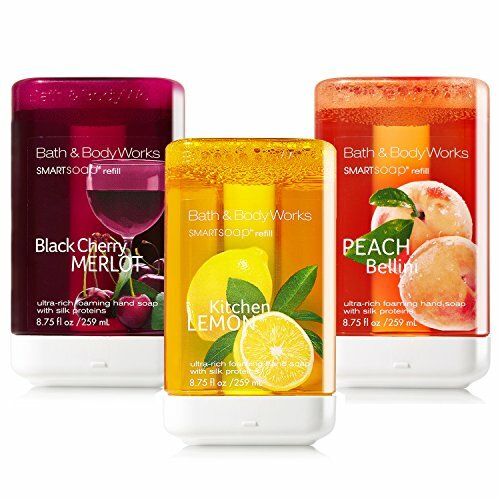 You receive 3 refill bottles of Bath and Body Works Classic Favorites Smart Soaps - one Kitchen Lemon Smart Soap, one Black Cherry Merlot Smart Soap, and one Peach Bellini Smart Soap. Bath and Body Works Kitchen Lemon is a fresh blend of zesty lemon, sparkling citrus & Italian bergamot. Bath and Body Works Black Cherry Merlot is an addictive blend of dark cherry, black raspberry and sumptuous merlot. Bath and Body Works Peach Bellini is a delicious twist of juicy peach, white apricot and fresh mango. Use exclusively with Bath & Body Works Smart Soap Automatic No-Touch Hand Soap Dispensers (sold separately). This new, premium formula with skin-softening silk proteins provides a luxurious, extra-rich lather and leaves skin feeling softer, smoother and silkier than ever before. You receive 3 bottles of Bath and Body Works Smart Soaps - one Kitchen Lemon Smart Soap, one Black Cherry Merlot Smart Soap, and one Peach Bellini Smart Soap. Use in bathrooms, kitchens, even laundry rooms! Great for schools and day care centers to limit the spread of germs - kids love the fun of the automatic dispenser too! New, premium formula with skin-softening silk proteins provides a luxurious, extra-rich lather and leaves skin feeling softer, smoother and silkier than ever before.